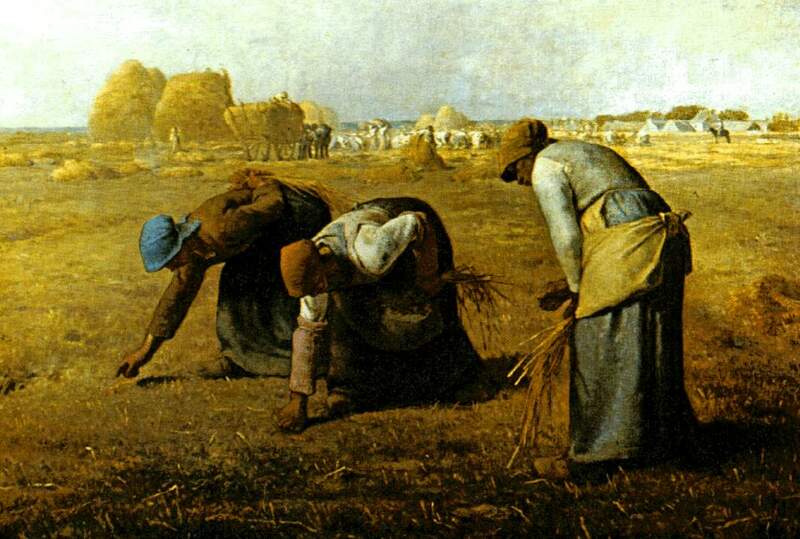 The Gleaners by Jean Francois Millet, 1857.
practice my chicken charming skills in order to improve. Just you wait. I like your chicken art! Too funny! You are enjoying having chickens in more ways than one! happy summer to you. A happy summer to you as well! As a museum art handler and art historian, I appreciate this vastly! I’ve actually handled the Millet before, many years ago when it travelled. There’s nothing like holding an object like that in your gloved hands. It’s mind blowing. Especially when you have to deframe a painting. Georgia O’Keeffe would often write in pencil all over the back of her canvases. It’s the most intimate experience to hold it like your reading a book! I think art can be the best sort of connection to the past and those before us. Mostly not tangible; you are so lucky to work as you do! Cute! What if you photo-shopped your chickens into similar backgrounds? Good idea, I will have a try at that next time. I think grandma Moses and Andrew Wyeth are next. If Elvis the rooster crooned rather than crowed, he’d surely be a keeper. Great name!